Gosh it’s been such a long time since I’ve blogged, honestly nearly forgot how to do it 🙂 But guys I’m back and looking forward to share with you a quick and simple lunch recipe. I’ve always liked tuna melt sandwiches but it’s just been made better because John West have just released their Fiery range – Tangy Jalepeno, Smokey Chipotle, Red Hot Siracha and Inferno. Only 3 ingredients needed to make this delicious sandwich – bread, can of Fiery tuna and tasty cheese. Which means it’s easy for you to take these to work and make it at lunch time. You can buy the new John West Fiery range from most supermarkets! 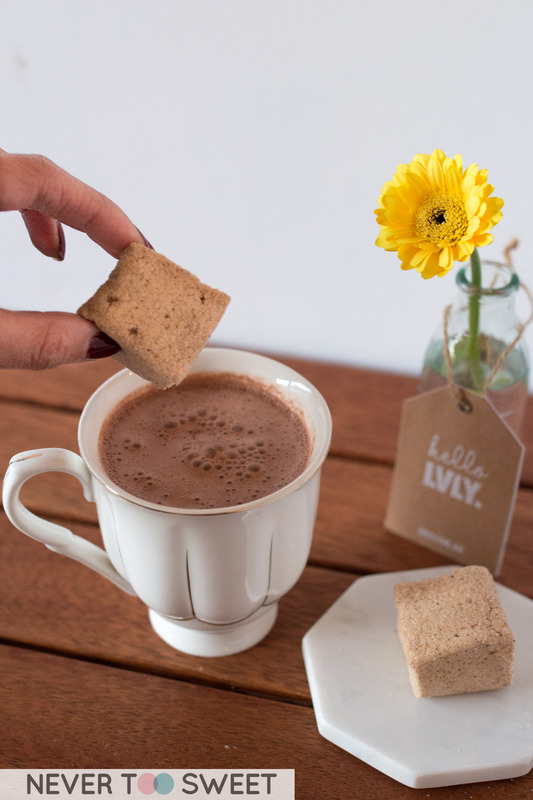 Hope you will enjoy this recipe too! 1) Spread tuna over the bread and then place 1-2 slices of cheese over. 2) Melt and toast on a sandwich press until the cheese has melted, cut in half, garnish with salad and enjoy! 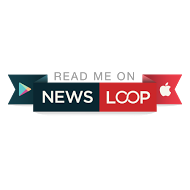 Hello Dear Readers! Did you just recognise that? Those are the lyrics to the Australian Anthem 🙂 It’s going to be Australia day tomorrow! Have you already got plans with family and friends? I remember back in primary school we had to sing the national anthem every Monday morning when we had our morning meeting. Now I rarely hear national anthem it’s only played during sporting events! If you don’t know what to make for Australia Day, nothing’s more Australians than putting the barbie on 😀 If you remember we were gifted last year with a weber and chimney booster, this year I am very excited about working with Heat Beads® again to share some easy and delicious recipes with you. Mr Bao went all out this year…and even though there’s only the two of us…he decided to make beef brisket and a whooping 2.1kg of it! He wanted to try the slow and low method to cook the brisket until it reaches that soft fall off the fork texture. To make it a complete feast we also made sticky BBQ pork Ribs and an apple slaw and corn salad for sides. Because it was going to take 8 hours, we started the rub and marinated the beef brisket over night and started the cooking process at around 9am in the morning. Set up the weber using an indirect heat which keeps the temperature lower but more consistent to allow for the slow and low method of cooking the meat. We found it was particularly easy with the Heat Beads® because they all ashed over evenly. We also used Mesquite wood chips to add to the smokey flavour of the brisket. Make sure you do the first round of cooking direct without wrapping the beef, this allows the outside to be slightly cooked and seals the juices. It is then wrapped in foil and cooked in low temperature over a longer period of time. Happy Barbecuing!!! Make sure you let me if you try the recipe! Wishing you all a Happy Australia Day 🙂 I am very proud of be Australia! I love how country and so glad to call it home! PS. Please let me know if you would like me to share any other recipe such as the sticky pork ribs or the recipe for the sides. 1) Mix all ingredients to make the rub together. Rub the mixture onto the brisket and wrap tightly in cling warp. Refrigerate and marinate for at least 6 hours or overnight. Be sure to remove the meat from the refrigerator and let it come to room temperature before cooking. 2) Soak the mesquite wood chips in a large bowl of water for 1-2 hours. Remove and drain and set aside. This is a very important step to avoid the wood from burning. 3) Set up the weber or any other charcoal barbecues according to the manufacturers instructions. Make sure it is an indirect heat until it reaches around 135ºC. Place a water pan filled to about 2/3 full in between the baskets filled with Heat Beads® briquettes. When you are ready to cook to brisket, place it uncovered on the rack for 1 hour. 4) Remove the brisket from the rack and wrap it tightly in heavy aluminium foil (double layer it!). Return it to the weber, however, keeping the temperature is around 80ºC to 95ºC and let it cook for 5-6 hours or until the meat is tender. Let the meat rest in the weber for 20 minutes before serving. Happy New Year my Dearest Readers 🙂 Hope you’ve all had a wonderful Christmas and New Years! I plan of posting more frequently…clearly hasn’t worked! Again the same reasons (excuses!) being very busy at work and we also had friends coming over staying with us. Anyhow! my New Years resolution is to share more exciting events, reviews and recipes with you all! That’s why I’m going to start 2016 with a Mini Victoria Sponge cake recipe 🙂 This recipe is inspired by the new range Anchor cream that KeepLeft PR sent me. I really like the bottle and screw top packaging, I feel like it keeps the cream fresher for longer. It’s also got those clever lines on the side, so you know exactly how much you’re pouring without having to use another measuring cup. Meaning one thing less to wash, now that’s always a bonus. The Anchor cream is now selling exclusively at Woolworths. Hope you like this recipe! Please share and let me know if you’ve made them! 1) Preheat the oven to 190°C (170°C fan forced) or 376°C, lightly grease a shallow tray with butter and cover with baking paper to prevent sticking. 2) Using an electric mixer or by hand mix butter and caster sugar together until the mixture is very pale and light. Make sure to scrap the sides this will take approximately 5 minutes. Gradually add the beaten eggs, mixing well between each addition and again scrape the bowl. Add the Vanilla extra and mix to combine. 3) Sift the self raising flour into the mixing bowl and gently fold in until the mixture is glossy and smooth. Try not to over fold or mix. 4) Spread over prepared pan and bake for about 25-30 minutes. Until lightly golden brown, check whether it is cooked using a skewer if it comes out clean it is cooked. Leave it to cool in the tin for a couple of minutes before removing it from pan. 5) Poor Anchor Thickened cream into bowl and whip until soft peaks form. 6) Once sponge cake is cool enough, use a cookie cutter to cut into small disks. 7) To assemble use one cake as the base, place one tablespoon of whipped cream followed by strawberry jam another cake and dust with icing sugar. Thank you everyone for the warm welcome back 🙂 I can’t describe how much it means to me! I’m trying to do one blog post a week and eventually get back to posting 2-3 times a week, but please be patient with me! Got some bad news that my new manager is leaving and moving on soon…which is really sad because I only just started in the team. However, I am so happy for him to be spending more time with his young children and the next stage of his career. However, the event that I enjoyed the most would be the ‘Create Your Own Perfume’ held at the hidden but gorgeous Mon Bijiou on Flinders Lane. The day started at around 9:20am when our lovely driver picked us up in a Ivory White and Diamond Black Captur, I’ve been in this car many times and it always surprises me how spacious it is both in the front and back. We then arrived at the venue at around 10am and all settled in with a glass of champagne in hand and took time to enjoy the great scenery Melbourne has to offer. Once all the guests had arrived, we sat down in our seats and was introduced to Emma the owner and perfumer of Fleurage based in Williamstown. She explained to use how we were going to create our own personal scent and that perfumes consist of a base, heart and top notes. Which made sense because when I spray perfume, I can smell the different layers of scents. It was very interesting the first thing we were asked to do was to fill out a short questionnaire and Emma would then give us indication of what colour of scents we should focus on smelling. For instance, one of the question was which season do you like the most and I chose Spring because I’ve always like floral sweet scents and rest assure I was asked to smell and focus on the scents in the ‘pink’ section. While Mr Bao (yes I dragged him along with me :P) much prefers Autumn and one of his favourite food is sushi…he was asked to focus not the ‘green’ and ‘black’ which had scents like seaweed!!! The next step was to choose 4 base notes, 7 heart notes and 2 top notes. You start from the bottom of the tray and move your way to the top. I thought it was going to be a lot harder to choose from 80 scents but I think I know myself very well, because it only took me a couple of minutes to choose everything. I chose scents like Gardenia, Jasmine, Honey Suckle, Fig and Vanilla all those sweet girly scents. While Mr Bao had a lot of trouble choosing between the woody or fresh grassy scents, he ended up with Fernwood, Sandalwood, Lime and Citrus huge contrast from mine. So glad they had coffee beans for us to refresh our noses because honestly after a while my nose was getting desensitised and I couldn’t distinguish the different scents. That’s why I have so much respect for Emma, she didn’t have any trouble with the scents and was able to quickly formulate each and everyone of our perfumes! That’s about 20 in only 10 minutes or so. Once we got our ‘formula’ from Emma, it’s actually quite easy to ‘make our own perfume’ we grabbed our bottles from the bag which had I believe distilled water and we started added drops of scents. You would add more droplets of those that you want to have a stronger presence in the perfume, like mine I had more drops of rose and jasmine. Thanks Mr Bao for capturing this photo! It’s my favourite from the day! Never Too Sweet Own Scent! Ta da!!! Here it is! My very own Never Too Sweet perfume! Staying true to my brand it’s a very sweet florally perfume with strong musk, jasmine and apple notes haha. While Mr Bao’s was very citrusy and refreshing with grass, sandalwood, lime, mint and orange. Mr Bao was very skeptical at first when I told him we were going to a perfume making class, but he thoroughly enjoyed himself and has been using his own cologne since then. I’ve been joking once he’s used up his bottle he wont have his own signature scent anymore but not to worry because Emma offers a refilling service for $2.5 a ml which works out to be around $125 for 50mls. For more information about Creating Your Own Perfume please visit the Fleaurage website 😀 I think its a great idea for a birthday party or a bridal shower, I highly recommend it and would love to do it again. Now let’s move onto the FOOD because at the end of the day I am a food blogger and eating takes precedent over every if not most things 😀 And don’t forget camera eats first hehe I’m glad the waitress was so patient and would come to me first with the food, because she knew I wanted to take a photo. The catering was done by Om Nom from the Adelphi Hotel which means we were in for a treat because food is always great. I still remember when we stayed at the hotel last year for my birthday and I really enjoyed the room service. All the savoury canapés were presented so nicely with a heart shape skewer and all tasted delicious! I was impressed with how much flavour such small items had. They were also a great size not too big or small and no mess when eating them. My favourite was definitely the soft shell crab with aioli, deep fried but not greasy. Wish I grabbed another one! I really love how soft shell crab is such a trendy food item now it appears on most menus, I remember when it use to be limited to Japanese restaurants. 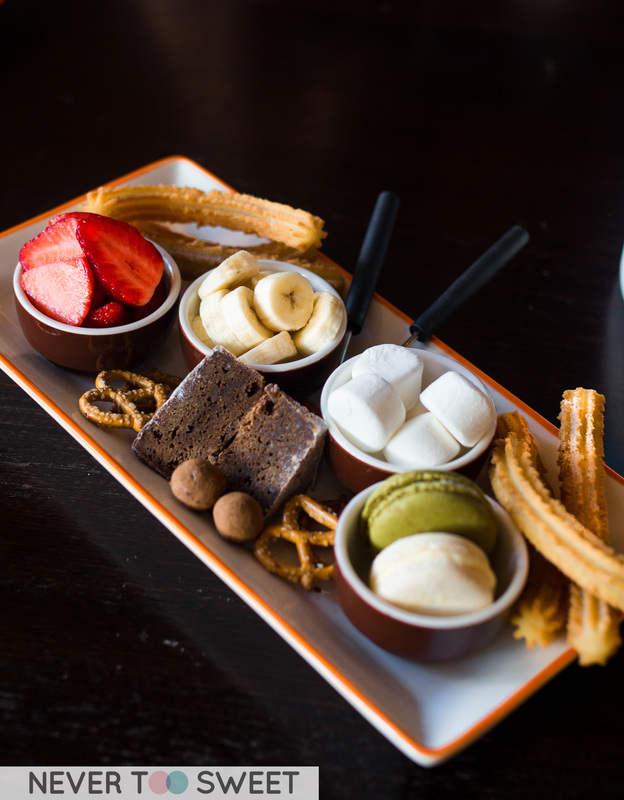 As for sweets they had mini Churros with chocolate sauce and also Rapsberry sorbet with fresh berries and meringue pieces. Another smart way of serving sorbet no spoons required, as they are made into little discs very refreshing. Huge thank you to Renault Australia and Soda Communications for hosting another fantastic event and for inviting us. What more could I ask for delicious food, great fun and even better company! I’ve also entered in a competition and the more people who book a test drive and mentioned from Never Too Sweet the higher chance for me to win and the prize is to drive the Captur for 3 months at our own leisure. Please let me know if you have any questions. Have a wonderful week ahead! Daisy@Nevertoosweet and Mr Bao was invited as a guest of Renault Australia and Soda Communications all opinions are based from our own experience. Even though, I haven’t had the chance to blog, I update instagram (@daisy_nevertoosweet) so please follow me there for daily posts. I have so many new and exciting events, restaurant reviews and recipes, that I look forward to sharing with you! Anyhow, let’s start with a super easy 5 minute cheat dessert! Honestly the easiest but most impressive dessert I’ve made 🙂 No cooking, stirring and minimal washing. Because I’m now working longer hours and have less time to be in the kitchen, I need to find short cuts to at least make a dessert which can impress my friends when they come over. This may be a good dessert to make for any upcoming Christmas parties you may have. Thank you everyone for your continuous support and I promise to update more regularly again! 1) Place Gingernut biscuits in a ziplock bag and crush into crumbs. 2) Ensure your glass jars are dry and clean, place a thin later of cookie crumbs in the bottom of the jars. 3) Layer with 2 tablespoons of Vanilla yoghurt then layer 2 tablespoons of lemon curd. 4) Repeat until the jars are filled and finish with the lemon curd and sprinkle with some more Gingernut cookie crumbs. 5) Finally garnish with mint leave if you wish. Hello My Dearest Reader’s apologies for the short hiatus! I’ve got so much to update you, I have recently started a new job, so that has kept my very busy! But I will provide you a full update in my next post 🙂 Today I have a super fun post to share with you! 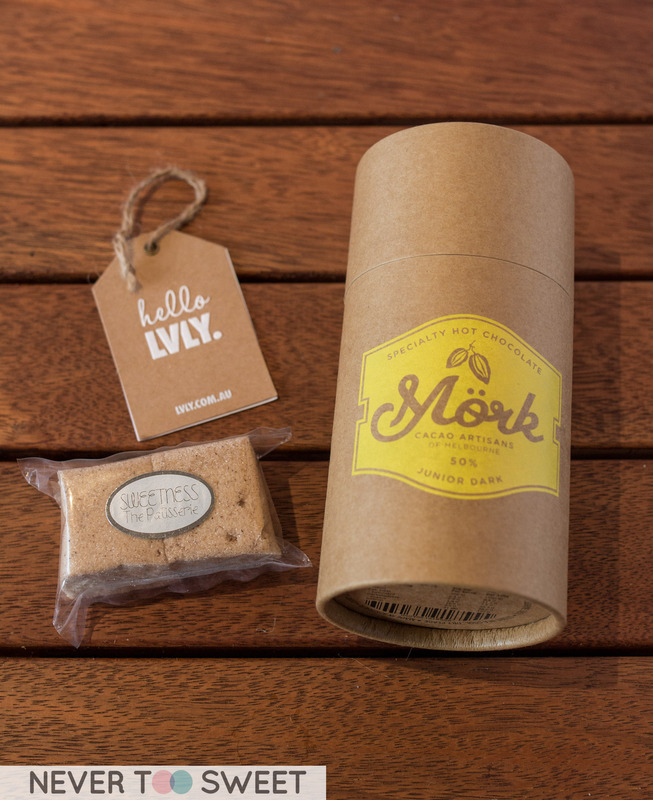 I was recently introduced to Lvly.com an online service which delivers ‘small, thoughtful gifts delivered same day Melbourne’. Imagine receiving this at 2pm on a Wednesday afternoon on hump day, when you just want the day to be over. 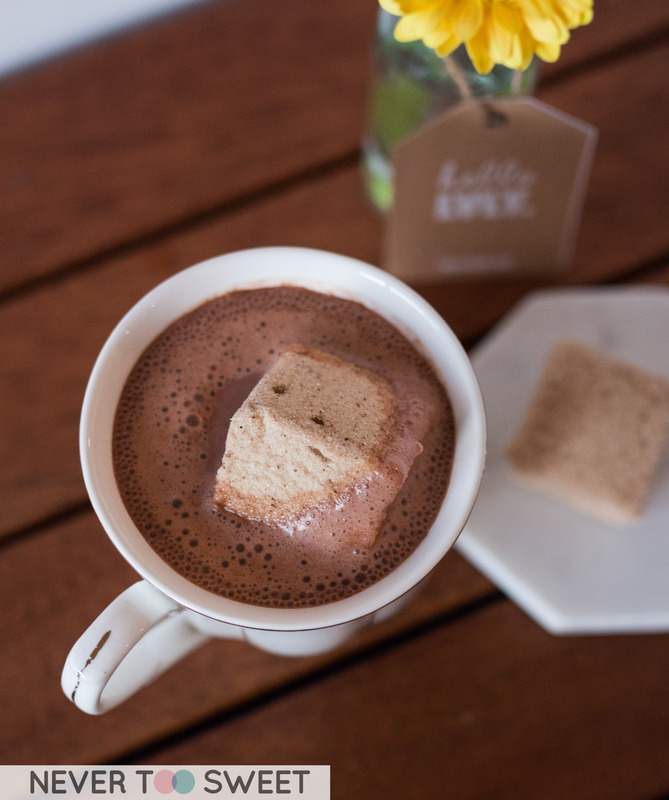 You can make yourself a piping hot chocolate at your desk and pop a marshmallow inside and watch it melt slightly. Let me show you! The marshmallows are so squishy, soft and fluffy! 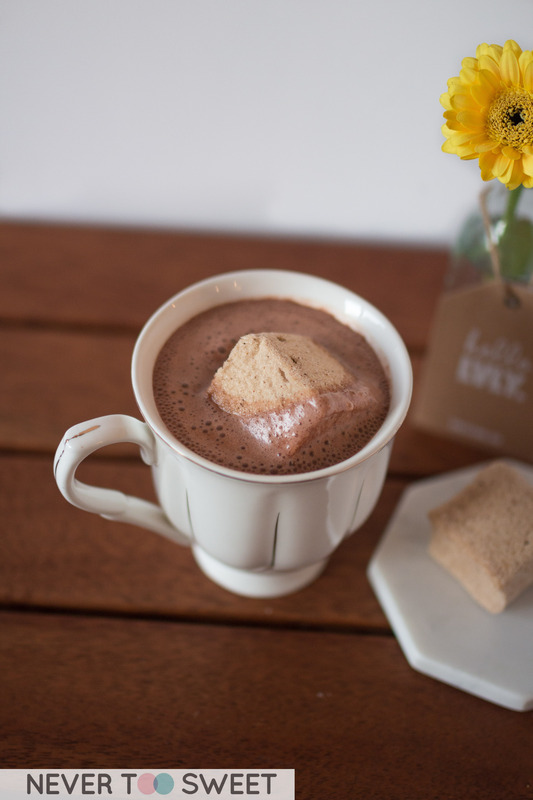 When I order a Lvly hug-a-mug set for someone I will definitely order more marshmallows because 2 is simply not enough. 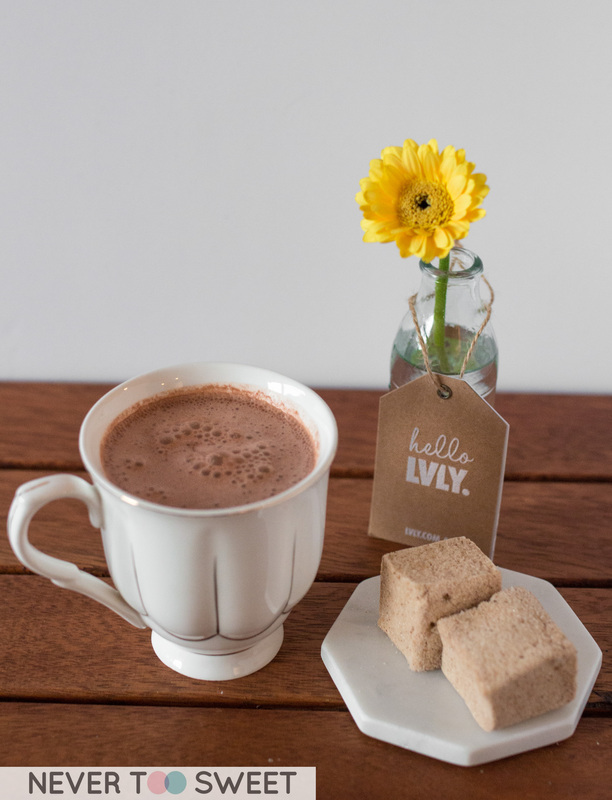 How good does this hot chocolate look? Sorry guys I’m not sharing haha I wouldn’t even let Mr Bao have a sip so please make your own hehe just kidding! 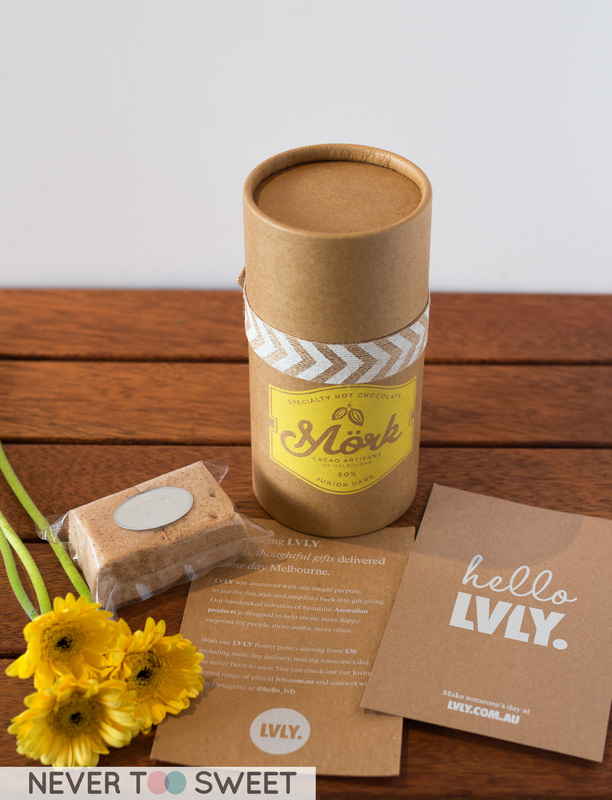 I’ve really enjoyed my gift from Lvly and already have my eyes set on their LVLY Posy subscription where you receive one bunch of posy a week for four weeks. And yes they are for myself haha who said you can’t order gifts for yourself! Ok ok I might get Mr Bao a LVLY Little sucker a little concrete pot plant and I might add a chocolate fix to it just because I’m so nice. Thanks again LVLY.com for the gift and for more information please check out their website. This is a sponsored by LVLY.com all opinions are honest and true. 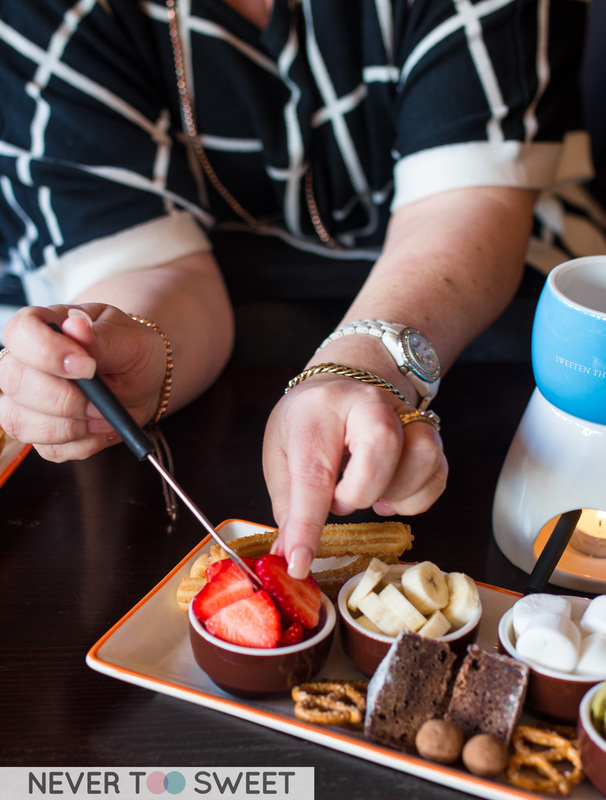 Today’s post is a little different, of course it’s all about churros those delectable fried Spanish Donuts that San Churros specialising in making but more importantly it’s about their campaign to support beyondblue – an independent non-profit organisation working to address issues associated with depression, anxiety disorders and related mental illnesses. 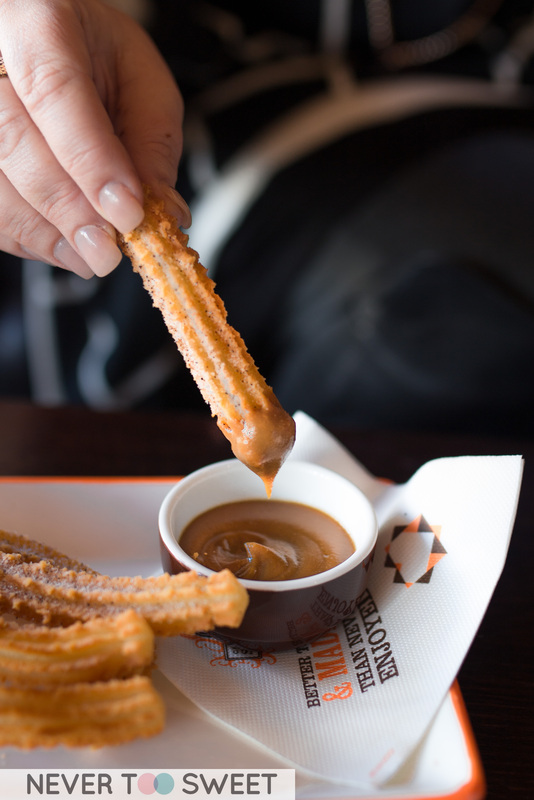 San Churros has launched ‘Share A Churros Week’ and from the 15th-21st of June (this week) every churros sold $1 will be donated to beyondblue. When I was asked if I would like to help promote this campaign I couldn’t have said any quicker. Unfortunately, a few people very close to me suffer from depression and anxiety, I have seen first hand how it affects them. Therefore, if there’s anything I can do to support and help the charity I will definitely do it. I know it’s very important for people who suffer depression and anxiety to have the support from family and friends. Therefore, it’s a great concept of ‘Share A Churros’ because I honestly believe food can bring people together and because there’s endorphins in chocolate hehe that’s why I asked a dear friend of mine Catherine from Sweet Empire to go to San Churros and have a churros feast with me. 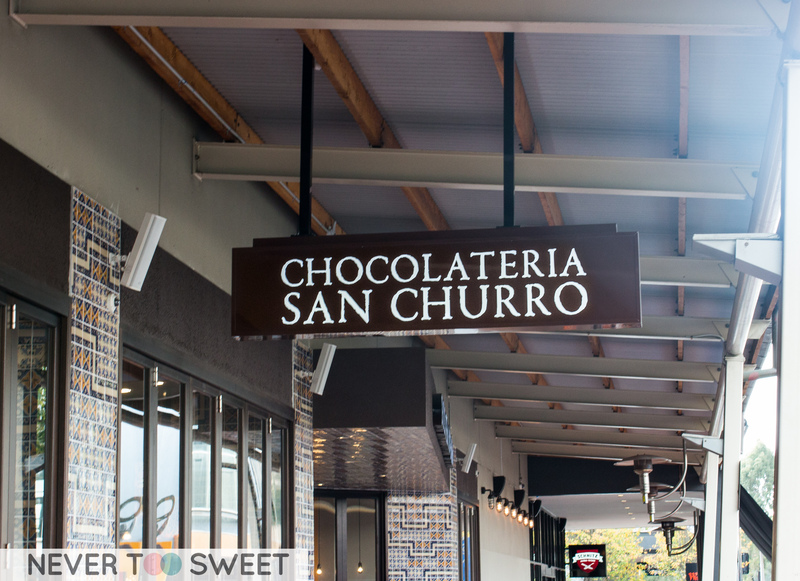 The are quite a few San Churros outlets in Melbourne, we found the one in Westfield Knox in Wantirna to be the closest to us both. We met at the newly renovated store it is much bigger and spacious compared to the kiosk they use to have inside the shopping centre. With plenty of seating inside and sunlight shining through it is a great place for business meeting, afternoon tea and dessert after dinner. They also have comfy black leather sofas which is where to settled down and ordered our drinks. 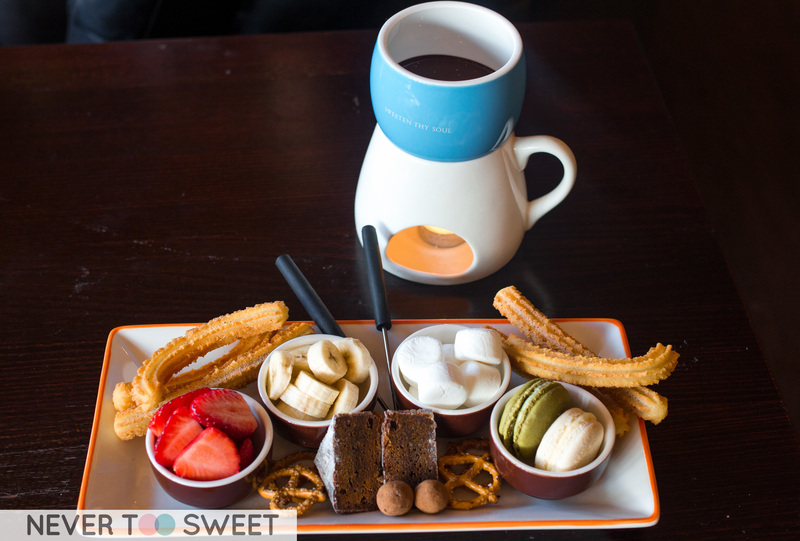 I can never leave without ordering the Azteca Spanish Hot chocolate which is chilli flavoured. 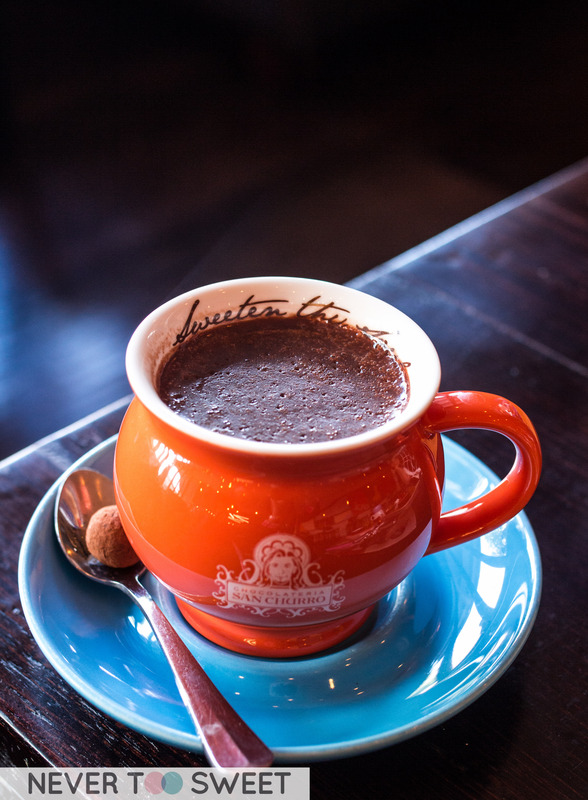 If you haven’t had a Spanish hot chocolate before, I am warning you now it is VERY VERY thick haha and not everyone will like it! I personally love it! It is so thick it’s more like a pudding especially when it’s a little colder and thickens up. The subtle chilli taste gives it some more heat and perfect for a cold winter night. They have other flavours for the hot chocolate which I like too such as the peanut butter! We then ordered a Churros For Two because it’s the perfect amount churros for us. Instead of milk and dark chocolate we decided to try something different and order the white chocolate which tasted a little like condense milk and dulce de leche (which is cooked condense milk to make a caramel). Thanks Catherine for being the hand model 🙂 Just look at that creamy dulce de leche! I’ve had the churros so many times haha my old office use to be walking distance to San Churros so yes I was a regular. They are made to order and freshly baked, never too oily and always crispy on the outside and soft inside with cinnamon sugar sprinkled over. I would’ve loved to invite more people, but they were all working and hey who said two can’t be a party 😛 We didn’t have breakfast so this made up for it, we ordered the Fondue For Two which had a great range of condiments. 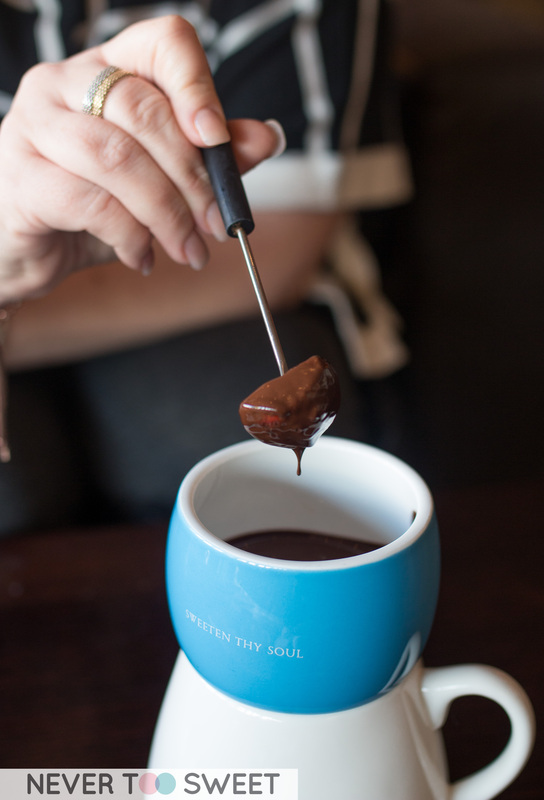 Firstly a big pot of melted dark chocolate that is a must for a fondue. 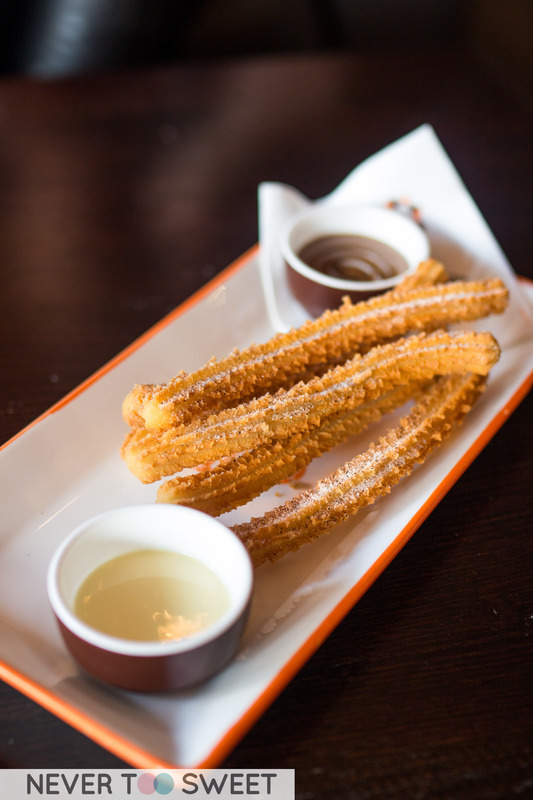 Then for dipping you had churros (of course! 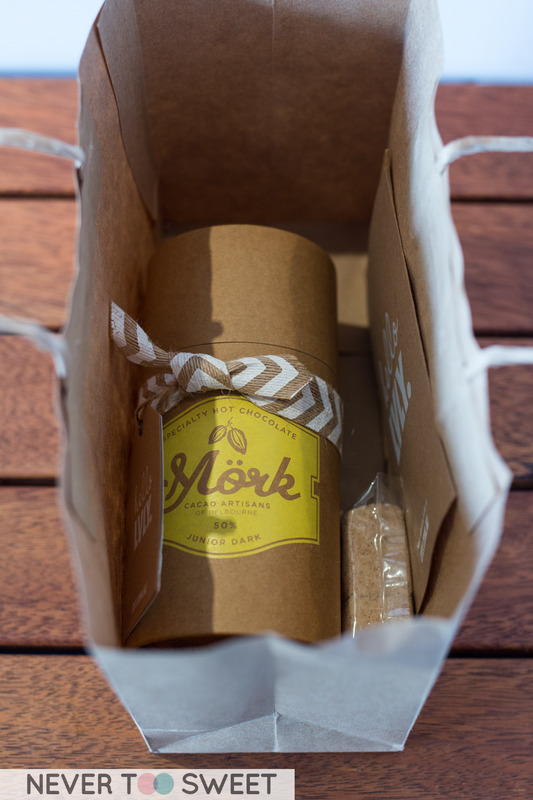 ), fresh strawberries, bananas, marshmallows, brownies, macarons (pistachio & NY Cheesecake), pretzels and chocolate truffles! WOW! Just looking at this platter makes me smile and want to share it with all my friends. I swear I have collected at least 3 fondue sets over the years, but I’ve never gotten around to using them. When I really should because it is such a great idea for dinner parties and so fun to eat using these little skewers. There we go the money shot! Fresh strawberries dipped in melted chocolate my favourite! What’s your favourite? 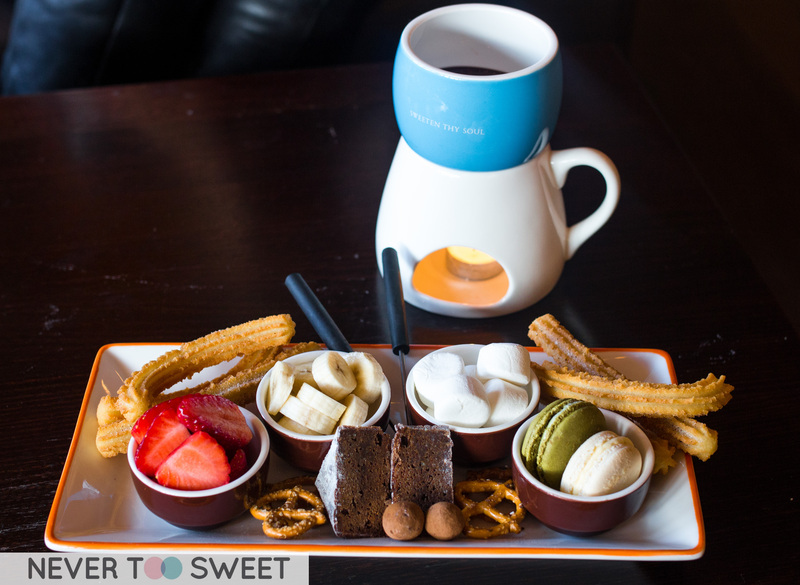 We had such a great time chatting and fully indulging ourselves in churros and chocolate. 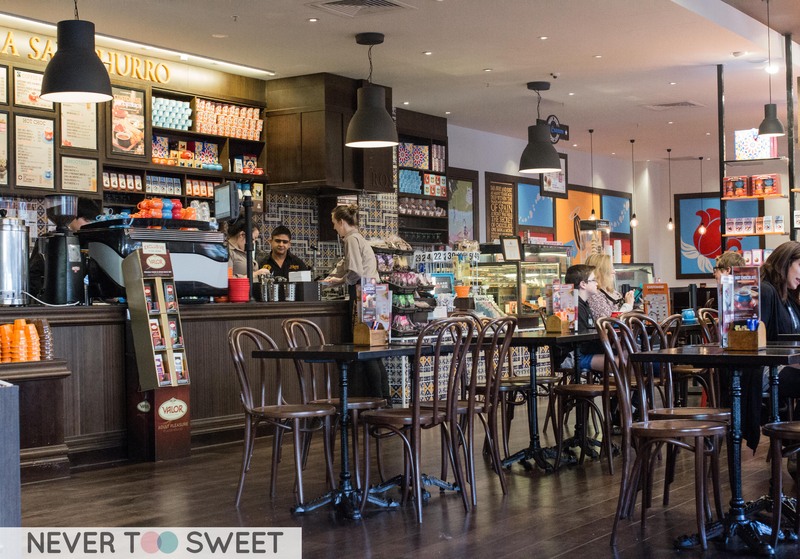 So please do me a favour and visit San Churros if you can this week, order some churros, share with your friends and help raise money for beyondblue! 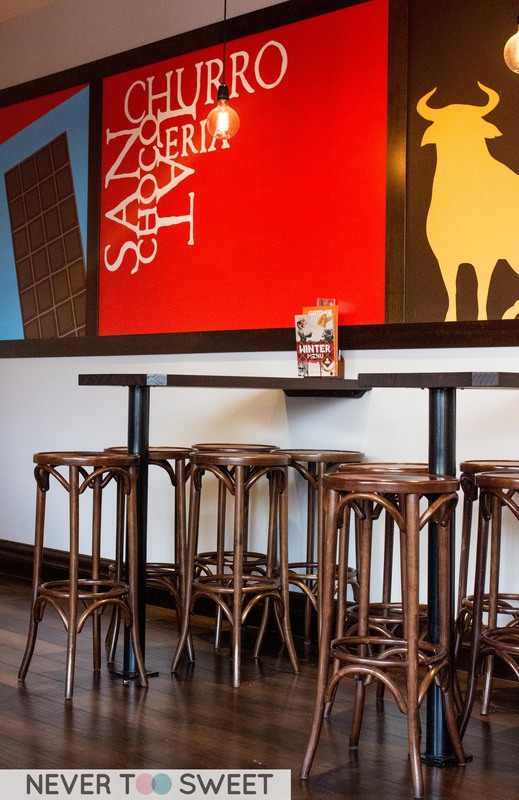 Please visit the San Churros website for the closest outlet near you. 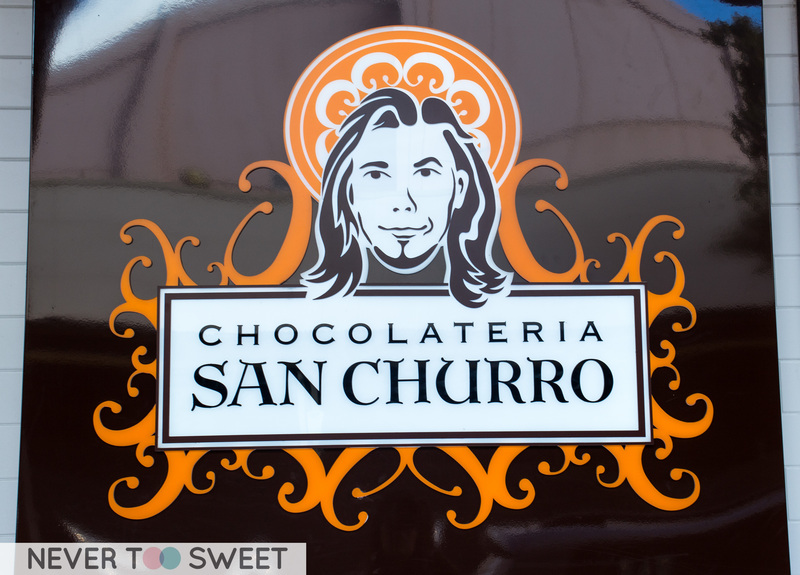 Daisy@Nevertoosweet and Catherine dined at San Churros as their guest and Haystac all opinions are true and honest.